(CNN) - In an interview on Saturday, Republican vice presidential candidate Paul Ryan said his Medicare proposal had "evolved" - with, among other influences, input from Democrats. "As we got into looking at this issue, talking with Democrats, it evolved to be a plan that is now bipartisan," the House Budget Committee chairman said in an interview with Fox News, referring to a compromise proposal he and Sen. Ron Wyden, a Democrat from Oregon, unveiled last December. Neither of Ryan's budgets, with proposals for Medicare, have passed the Democrat-controlled Senate. But now, as both Ryan and GOP presumptive presidential nominee Mitt Romney criticize President Barack Obama for his health care reform law, Democrats are using at least one part of the proposal to knock the congressman from Wisconsin in return. "I heard Mitt Romney deride the $700 billion cuts in Medicare that the president achieved through health care reform," Obama's deputy campaign manager, Stephanie Cutter, said last Sunday on CBS' Face the Nation. "And interestingly enough, Paul Ryan protected those cuts in his budget." At his rally in The Villages, Florida, earlier, Ryan leveled the charge to which Cutter was referring. 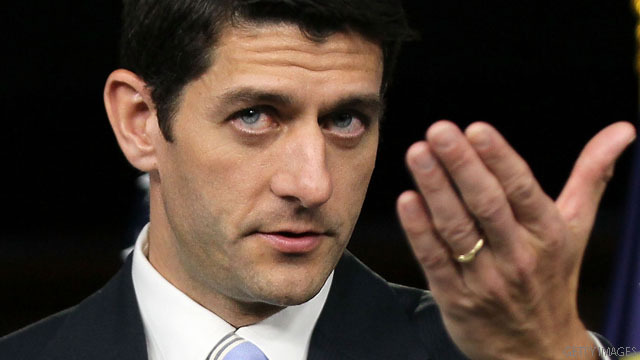 "Here's what the president won't tell you about his Medicare plan, about Obamacare," Ryan said. "The president raids $716 billion from the Medicare program to pay for the Obamacare program." The non-partisan fact-checker Politifact.com has rated a nearly identical charge by Romney, that Obama has "robbed" Medicare of the amount as "mostly false." It also found Cutter's assessment of the similarities - but not the description of reductions as "cuts" - between the Romney and Obama's plans to be "true." Asked in the Saturday interview to respond to that general point, Ryan said, "Well there's a lot to sort through. Look, we're offering leadership, we're offering solutions. The president is not. The president has a failed economic agenda - 23 million people are still looking for work." In a July interview with ABC News, Ryan explained that the difference between his plan and Obama's plan with regards to the $716 billion was how the money would be used. "Well, our budget keeps that money for Medicare to extend its solvency," he said. "What Obamacare does is it takes that money from Medicare to spend on Obamacare." Since Ryan was introduced to the Republican ticket a week ago, Democrats have criticized his budget and Medicare proposal. In an interview with a CNN affiliate in Wisconsin, WBAY, this week, Romney said, "Paul Ryan and my plan for Medicare, I think, is the same if not identical - it's probably close to identical." In a campaign memo circulated on Saturday, Romney's policy director, Lanhee Chen, explained that both candidates support a plan which "(a) makes no changes to Medicare for those over 55; (b) starting in 2022, transitions Medicare to a premium support model with competitive bidding to determine support levels, (c) offers traditional Medicare as an option competing in that system, and (d) means-tests the premium support so that lower-income seniors receive the most generous assistance." In his Fox interview, Ryan also echoed what he said in a Thursday paper statement, when he said he took responsibility for letters he signed and sent to federal agencies in support of stimulus-funded grants requested by a non-profit organization in his state. "My office sends tens of thousands of letters to versus federal agencies and this goes through what we call a case work system and we treat it as a case work for constituents," he said. "I take full responsibility for it, whether it's my intention to send letters supporting stimulus, this doesn't change the fact that the stimulus was a bomb, it didn't work, it's a boondoggle and borrowing and spending, spending on things like Solyndra, that doesn't create a job." Ryan had previously said he did not request stimulus funds, and said on Thursday that he was previously unaware of the letters. Liars are getting desperate now. He's going down in flames with Mitt the twit. It's nice to be Ryan's mom with millions in the bank, a large wealthy family and a powerful son, railing against the undeserving poor and the deserving rich. Of course he stads by it – were it not for lies, Republicans would have nothing to say. In Orwell's 1984, it was called Newspeak. To CNN: Why are you allowing "Restore Our Future" to "automatically" play ads when your readers go to your Home Page??? Their ads are propaganda and you, CNN, are controlling it – And it should work both ways coming from either side of the political line even though I have yet to hear an ad that favors President Obama! There should be a “play button” on all ads or videos and “I” should have the choice of playing it or not. Neither Fox News nor MSNBC websites do this!! If this continues, your readers will eventually change the “channel” and you will lose more ratings. Shame on You CNN!!! With his economic plan, it appears that Ryan now believes in "evolution." He also evolved from a catholic to an Ayn Rand disciple, and a budget busting Bushie war hawk to a fiscal conservative. He has further evolved from a person who voted against the Obama Stimulus, and took credit for the jobs it created in his district. What a tool the Mittens has chosen. Obama and the Democrats are now trying to lie their way out of the fact that they robbed Medicare to pay for Obamacare. Obama is on video tape admitting this during an interview. Obamacare was forced on the American people by Obama and the Democrats using every lie and trick in the book. Everything about it has turned out to be a lie, now they are lying about this too. How much lying and deceit can the American people take from Obama and the Democrats?! ENOUGH!! 4 more years of this treachery and this country is DONE, turn out the lights. Ryan says 'evolve,' but he is flip flopping like the weather vane he is running with. I am not sure, but I believe he has evolved into a liar. A DOSE OF REALITY. Let's see, the cost of a premium for 64 years old today is $1,500 per month. If you are 55 now it will be 12,years before you can hit 67. At a minimum, the insurance raise their premium of 15-17% per year. When you reach 67, the premium will be $7400 per month. Average social security recipient is $ 1500 per month. The government tagged an inflation of 3% per year. When you reach 67 and you are eligible for Medicare. You received a SS of $2,300 per month. Assuming Ryan is generous to give you a voucher of $5,100 per month, and you shell out the rest of your SS to pay for the rest of your health care premium. You won't have anything left to pay for even a dog food on your next meal.